Industrial/Gothic FFA level.........Probably my most complete level, and certainly the one I am am most satisfied with. Lighting the map took a long time to look right, but finally I am happy with the result. Huge thanks to Myth for the decals and shallow for the shader. I am pleased with the look of this and equally pleased that I finally managed to get the bots to be competitive and use the entire level. Fixing bot play on this level took one of those rare moments of genius that comes from hours of thought and failed previous attempts. 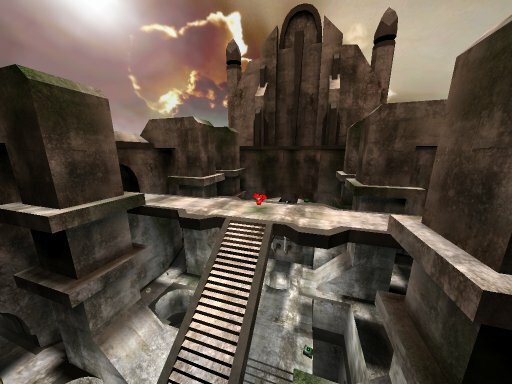 The level uses many of Q3map2's wonderful features such as increased lightmap resolution, dirty lightmaps, alphaMod blending, and ase model support, to name but a few. I love this, download it!